This family home is packed with award winning style! Architects Innauer Matt won Best Architects Award in 2016 for the design in this smooth and modern home. It boasts natural wood surfaces, pleasant views, open design and an overall warm ambiance. Don't let the charming barn-like exterior fool you, there was some sophisticated thought put into this little palace. It's not white, but it is dreamy. This fence and the wooden exterior bring a pastoral charm to the home. It's simple peaked roof is barn-like, but the solar panel hints at some technological features. 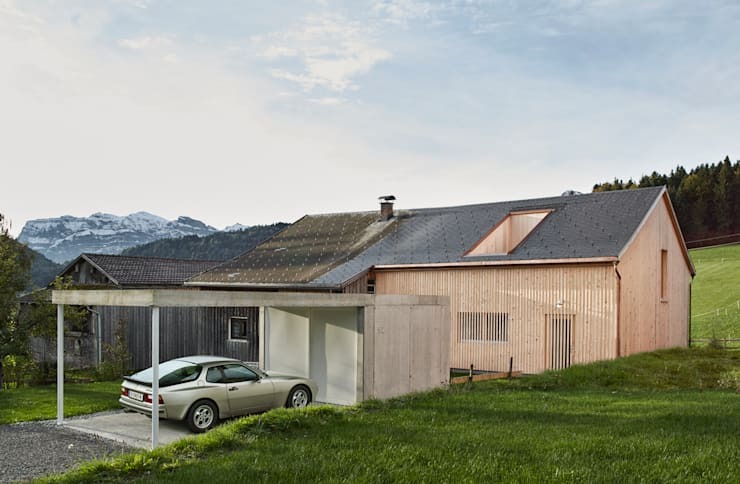 The concrete parking is clever, and makes this side of the home look dramatically more modern. The plain windows, and unadorned skylight still provide for a simplistic style. You don't need all the bells and whistles to have great design! 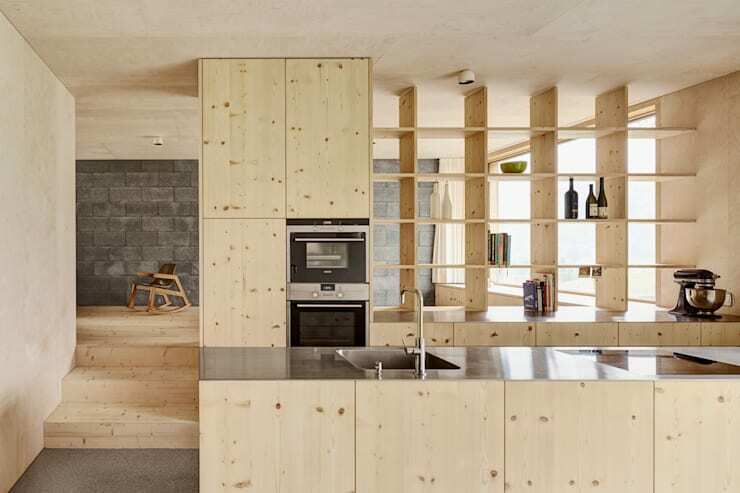 These light pine boards are full of small knots that add texture and natural character to the whole house. The wonderful material has been used everywhere, from the floor to the kitchen cupboards. The unity created by using a singular incredible material can't be matched. Modern kitchen design calls for a long space, creating more counter top space and more seating than a square kitchen could accomplish. The architects top this long space off with a phenomenal view, to which you feel drawn to. 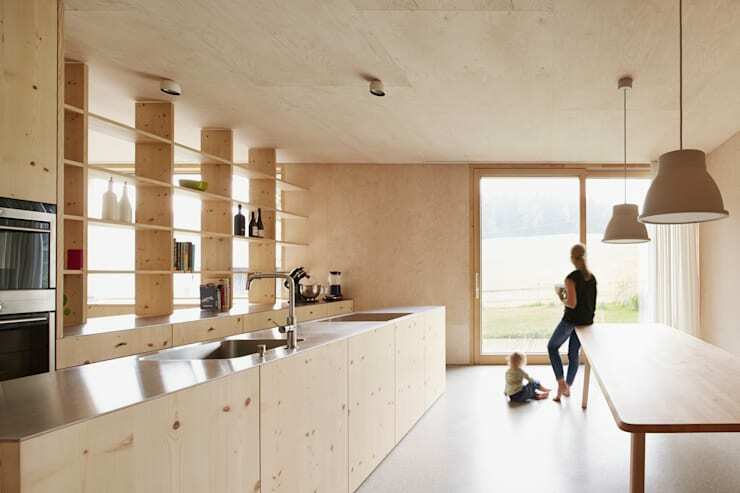 Take a look at our gallery here to find more examples of long kitchens. While relatively unadorned, this living room adds in a new texture, grey stone. 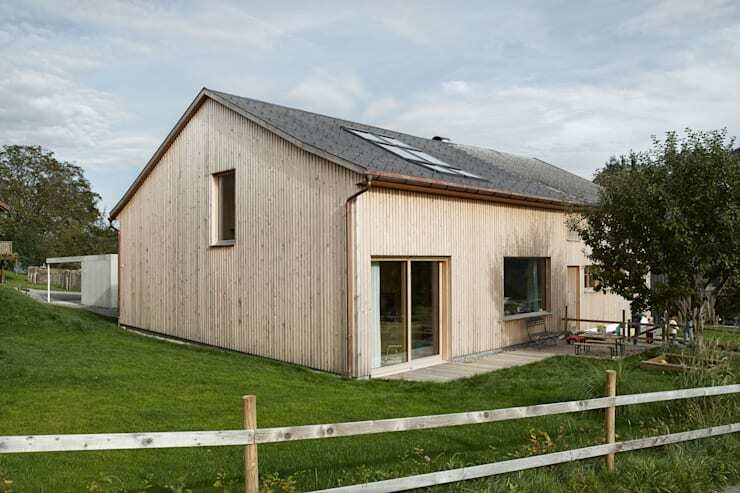 The wall fits with the natural style established by the pine boards, but feels sturdier. This kind of steady, solid material is the perfect choice for the living room, which is the heart of the home, after all. 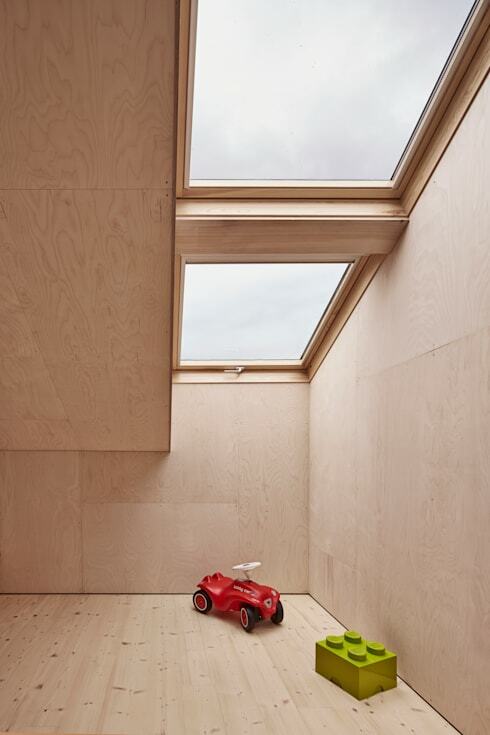 One of the cleverest modern uses for tiny attics is a playroom. 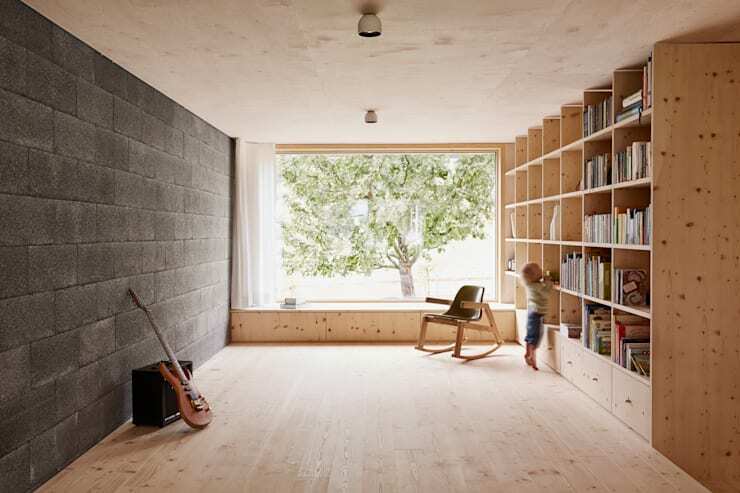 Children don't mind the low ceilings, and can feel free to run around, unlike in the rest of the home. The skylight has been added here to allow for some natural light to pour into the room. What a great way to keep kids in tune with the time of day while they're playing! Asking them to come down for bed at sunset makes perfect sense in this playroom. Speaking of sunset, the living room seems to take on a whole different feeling at dusk. The texture of the stone seems more prominent in this dim light, and the space still looks enormous and interesting. 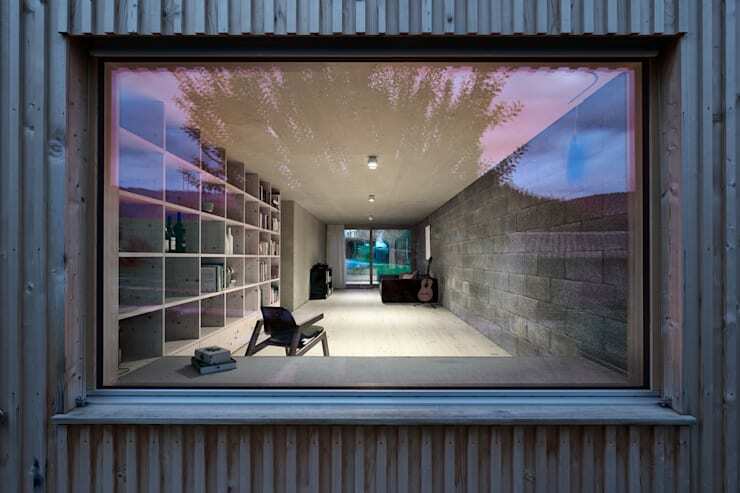 You can find more clever architecture on homify. Check out this home that the architect built by hand! Do you like this light pine wood with small knots, or is there another kind of wood you would use for this home?